When handling leaf clean-up, don’t forget that many falling leaves get trapped in the gutters Gutter debris can clog the channel and spouts, causing overflow when the autumn rain starts. 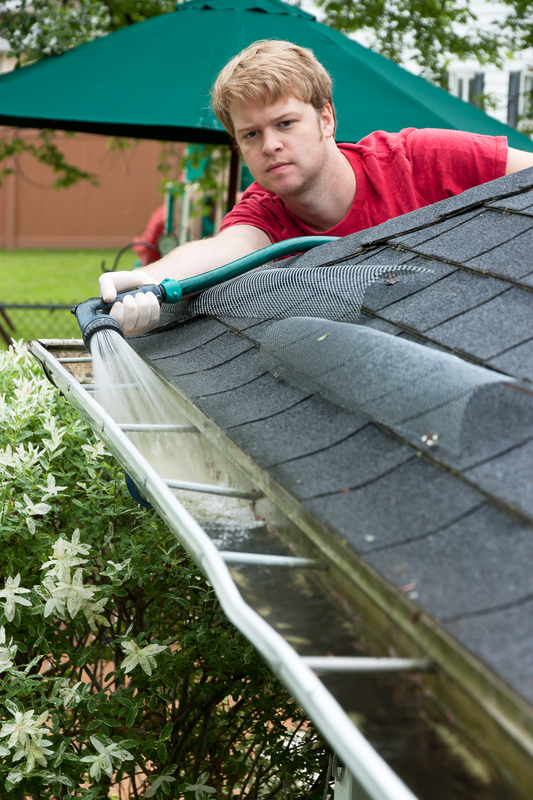 Use a ladder or cleaning tools that match the height of your gutters (or your accessibility). To avoid having to repeat the cleaning after the foliage drops, take time to trim any low-hanging tree branches near the house. If the bottom of your gutter downspouts are too short, fall and early winter rains can cause water to pool near your home’s foundation. That water can then infiltrate the foundation, finding its way into your basement and wicking up into your walls—attracting insects and causing rot or deterioration. Look for telltale signs like damp basement walls, wet spots on the basement floor or cracks in the foundation after a rain or widening cracks in the foundation. Solution: Attach a flexible downspout extender to direct water a minimum of 10 feet from your home’s foundation. Clean your outdoor furniture and allow it to dry in the sun. If you see any rust, cracking or chips on the surface, spray paint pieces with a high-quality outdoor paint for metal, wood or plastic. Buy a storage tarp at your local hardware or home improvement store to cover any furniture that is stored outside over the winter. Additional insulation can significantly cut down on your heating costs. If the tops of the joists (wood framing that runs across the floor and ceiling of your attic) are visible, you need more insulation. Add a layer or two of fiberglass batt insulation with a high R-value. If you have existing insulation in place, closed-cell spray foam or blown-in fiberglass or cellulose is the best way to fill any remaining gaps or crevices. If you have ceiling fans, change their rotation to clockwise to force warm air downward (there is usually a switch on the base to do this), and while you’re up there, dust and wipe down the blades with a damp or tacky cloth. Remove window air-conditioning units, vacuum the coils and filters and store the unit(s) in a cool, dry place, being sure to cover them to keep out dust and bugs. If you haven’t already done so, schedule your annual furnace maintenance call—before it’s time to star using it. Be sure to change air filters and keep an eye out for leaks around the furnace. Sediment build-up in the hot water tan can keep your heater from operating at optimum levels. Flush the annually to drain out gunk. Before starting, shut off the heater, let the tank cool, then turn off the water supply. Release the water into a floor drain or bucket until it runs clear. Your home’s electrical system is one of the most overlooked potential hazards, check for loose outlet covers and receptacle boxes. Also be on the lookout for scorch marks around and on the ends of plugs and in the breaker box, telltale signs of dangerous arcing. Plug a lamp or blow dryer into GFCI receptacles and push their test and reset buttons to make sure they turn on and off properly. Finally, install new batteries in all the smoke and carbon monoxide detectors. If you’re not comfortable tackling any specific maintenance or repair job, get professional help. A qualified home inspector can tell you exactly what’s going on and a competent contractor can address any issues. Inspect the roof and chimney for cracks and damage. Check windows and doors for weather-tightness and install weather stripping where needed.